A fidget spinner is a toy that you carry with you every single day (EDC). With this toy, you will be able to curb unwanted habits such as nail biting and smoking. Your boring time will pass away quickly and you will enjoying a good time when you alone. 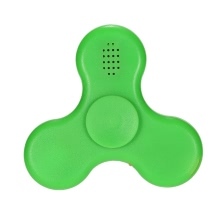 What is more important, this spinner has inserted with a BT speaker, which allows you to enjoy music while spinning. The LED inside it makes the spinner much cooler and more beautiful. You won&apos;t want to miss this one! Great for fidgety hands, helps relieve stress, anxiety and boredom. BT speaker and LED inserted, make spinning more enjoyable and cooler.